Half-Secure replication secures the specified password only: it does not secure data. Note that replication-security is established per reference: this means that the security level assigned to the reference (which specifies a remote cluster) is automatically assigned to all replications based on that reference. To enable a secure half connection with a destination cluster that may be either pre-5.5 or 5.5 and beyond, proceed as described below. The examples in the subsections below show how to half-secure a replication; using the UI, the CLI, and the REST API respectively. As their starting-point, the examples assume the scenario that concluded the page Resume a Replication. The Half radio button is checked by default: this means that half-secure replication is selected. The concludes UI-based enablement of half-secure replication. From this point, any existing replication based on the edited reference is continued in half-secure form. All new replications based on the edited reference will be started in half-secure form. The --create flag specifies that the command is being used to create a new reference. 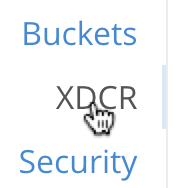 The --xdcr-username and --xdcr-password are those of the remote cluster. 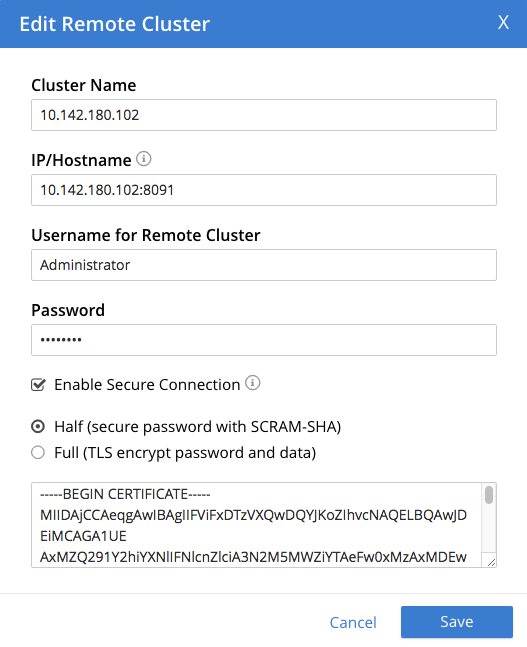 The --xdcr-certificate is the root certificate of the remote cluster, specified as a local pathname. The new reference is half secure, as will be all replications based on it. The --edit flag specifies that the command is being used to edit an existing reference. The edited reference and its assocated replications are now half-secure. To create or edit a reference, and attribute to it a particular security-level, use the /pools/default/remoteClusters URI. Reference-creation with this URI is already demonstrated in Create an XDCR Reference with the REST API: note that this example used the demandEncryption flag with a value of zero, to specify non-secure replications. 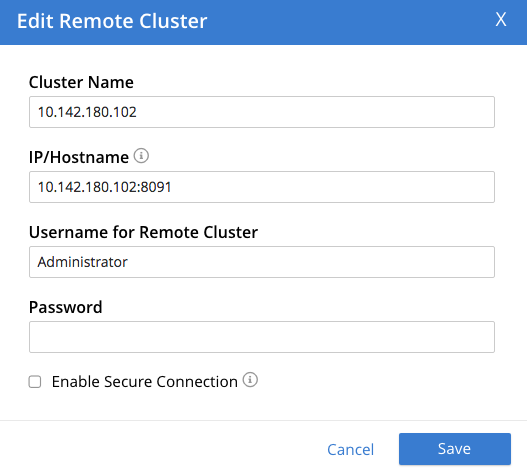 The username and password specified are those of the remote cluster. Note that the demandEncryption flag is set to true, and the encryptionType flag specifies half. The optional --dataurlencode flag specifies the local path to the root certificate for the remote cluster: this creates half-secure connections to remote clusters running pre-5.5 versions of Couchbase Enterprise Server. The secureType field indicates that the new reference is half secure. Note that the URI is here extended, to include the name of the remote cluster. (If this is not included, the command is interpreted as intended to create rather than to edit, and fails with a Duplicate cluster names are not allowed message.) The demandEncryption flag is specified as true, and the encryptionType is half. The secureType field indicates that the edited reference is now half secure. Replication can be fully secured; meaning that both the password and the data are encrypted with TLS. See Enable Fully Secure Replications.